The Notification Center in iOS is split into two sections: your new notifications, and your History. 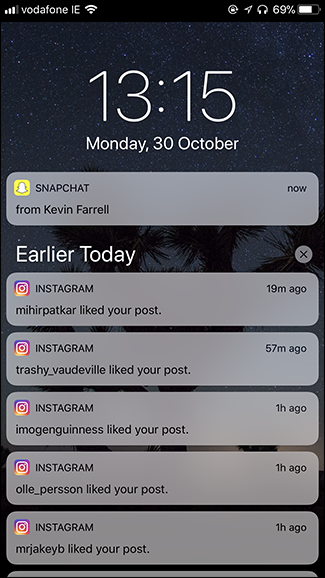 Notifications for things that have happened since you last looked at your phone appear at the top. After that you’ve got all the older notifications that you’ve seen but haven’t done anything about; they appear under Earlier Today, Yesterday, and so on. Most apps are pretty intelligent. 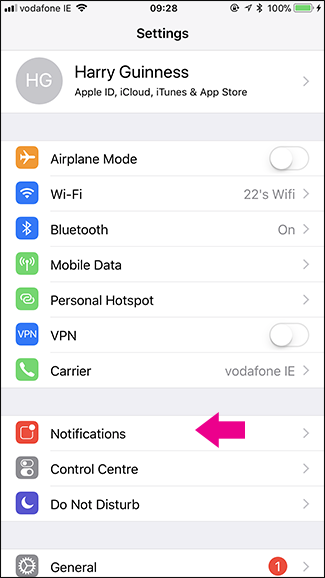 If you open Facebook, any Facebook notifications are removed from the Notification Center. Some are a bit more awkward. 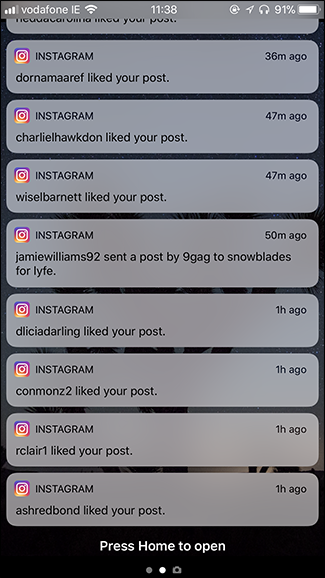 For some reason I have to manually dismiss all Instagram notifications; opening the app or even reading the relevant message isn’t enough. 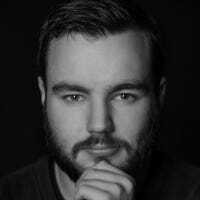 While the default behavior makes sense for any app where you actually need to respond or acknowledge notifications, for lots of apps it’s kind of a nuisance. Sure, I want to get the sweet sweet dopamine hit when people like my photos on Instagram, but I only need the notification to pop up once. After I’ve seen it, it’s no good to me. You can’t ride the same notification high twice. The much more useful thing would be for Instagram notifications to vanish once I’ve seen them. I’d still get my social buzz without having them clog up my Notification Center. Let’s look at how to set that up. This obviously works for any app, and you can enable it for any reason. I’m just using Instagram and social notifications as an obvious example. 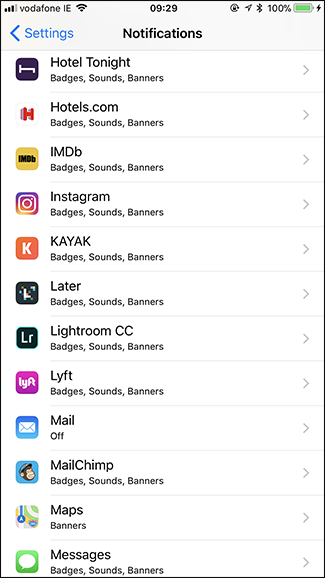 Go to Settings > Notifications and select the app in question—in my case, Instagram. 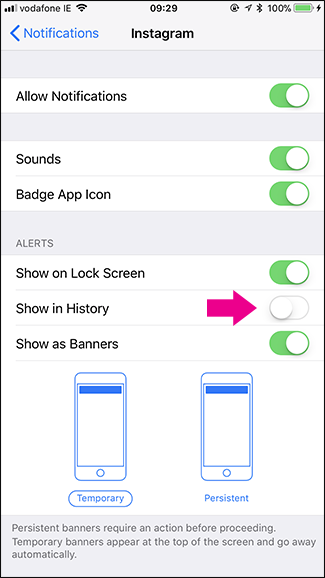 Under Alerts, turn the toggle next to Show in History off. 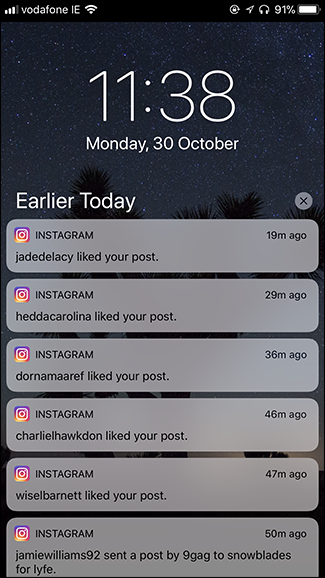 Now notifications will still appear on the Lock Screen and in the Notification Center, but as soon as you see them there once, they’ll automatically be dismissed.